Brown the thighs in a nonstick pan. Brown, not cook! 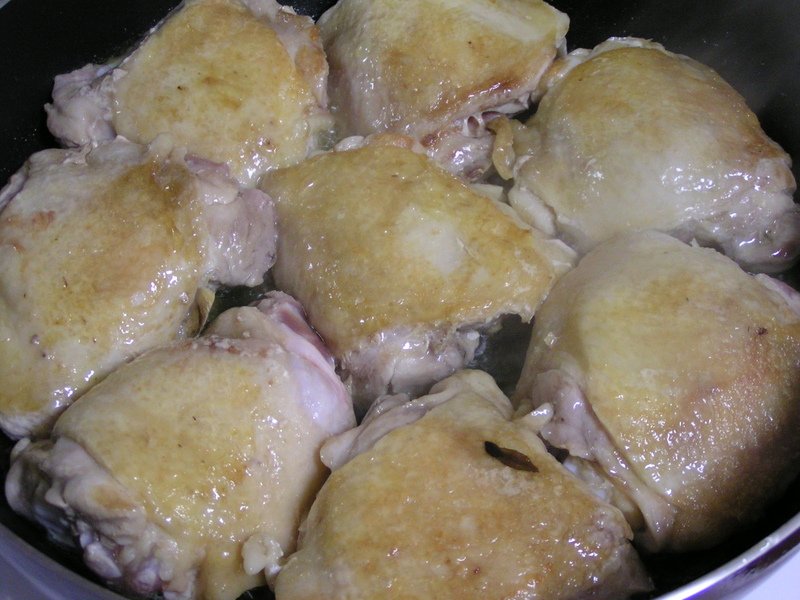 The thighs will juice out enough fat that you really don’t need to begin with oil or butter. Browning chicken is a beautiful thing, I think. While the chicken browns, dig out the crockpot or large heavy skillet like a dutch oven…if you’ll be home and have to fears about the stovetop being on all afternoon. 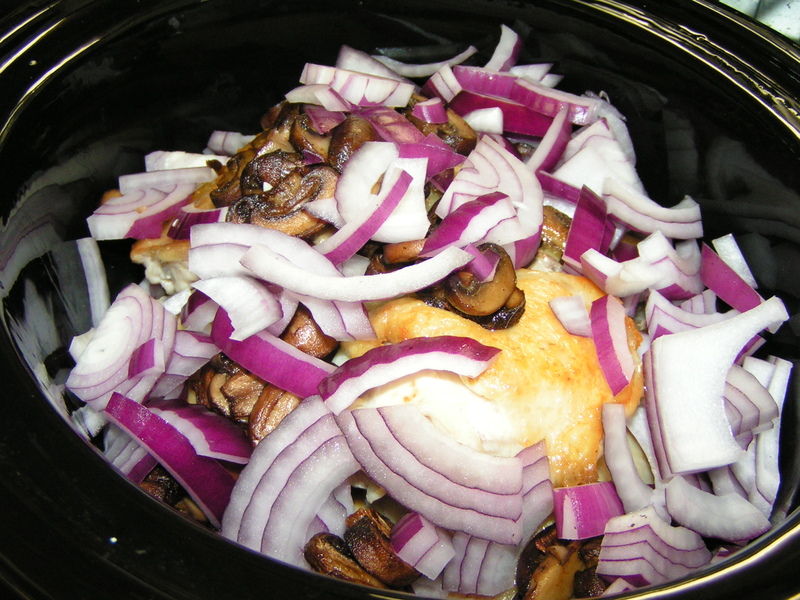 I use 1 package of Lipton mushroom and onion soup mix with 1 cup of white wine. Yes, I know it seems I must combine alcohol with all meals somehow! 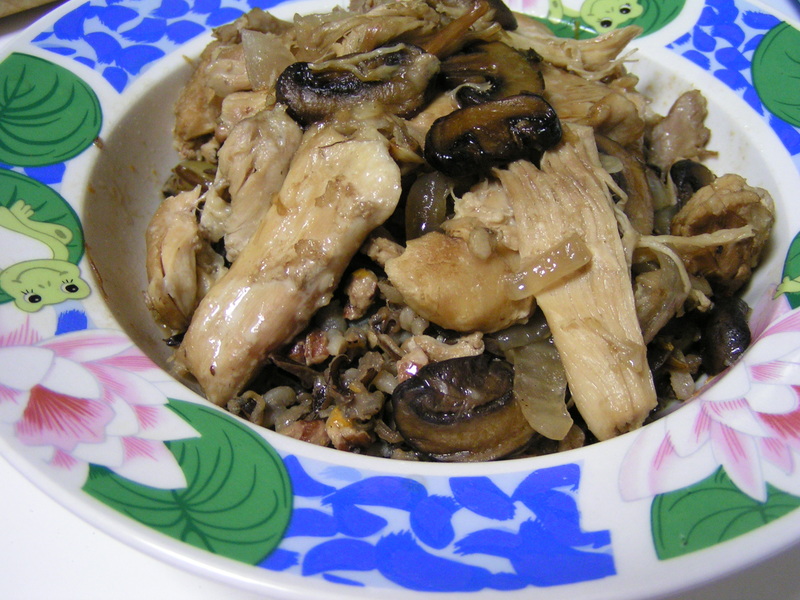 Place the beautiful brown chicken into the pot. 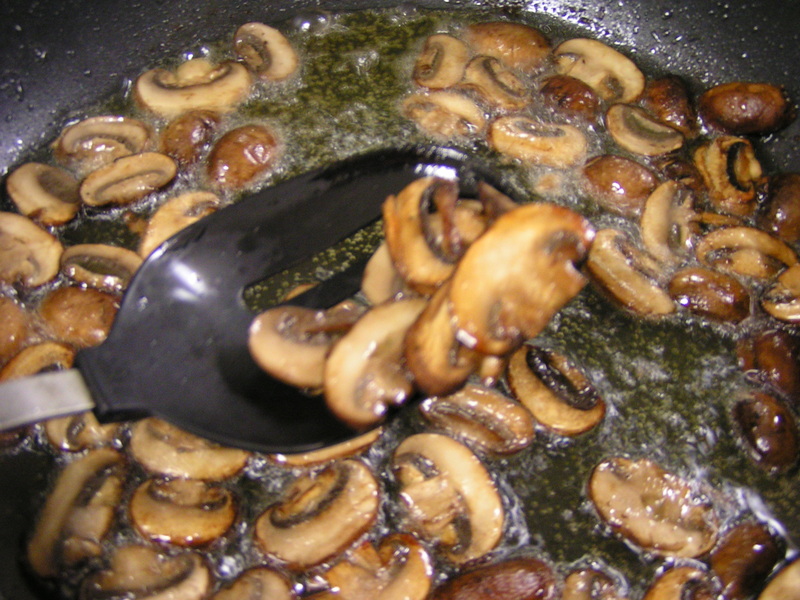 Use the residual chicken fat/oil to brown some sliced mushrooms. Don’t they just look beautiful all golden and crispified? 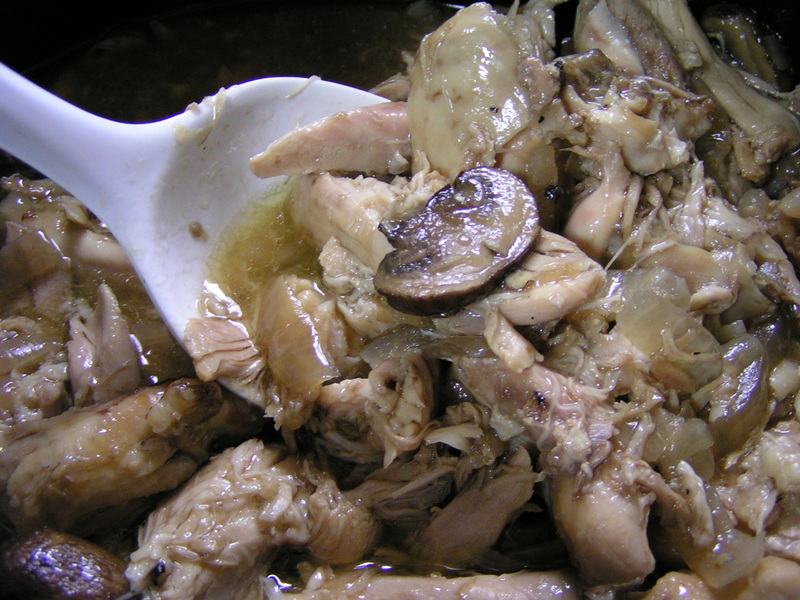 Put the mushrooms on top of the chicken, no need to drain. Use a slotted spoon so you don’t get a lot of grease, but a little will only add flavor! Chop an onion, and add that also. Leave it alone for about 4 hours on low, and just let the pot do its thing. If the chicken is still standing like a mountain out of the liquid after a couple of hours, stir a bit to get everything down into the liquid. After 4 hours or so, the chicken will just fall off the bone. I like to peel off the skin at this point, and remove any obvious bones. Previous Orange Pecan Wild Rice Next Caturday is here again! Ok, going to make this on Tuesday. 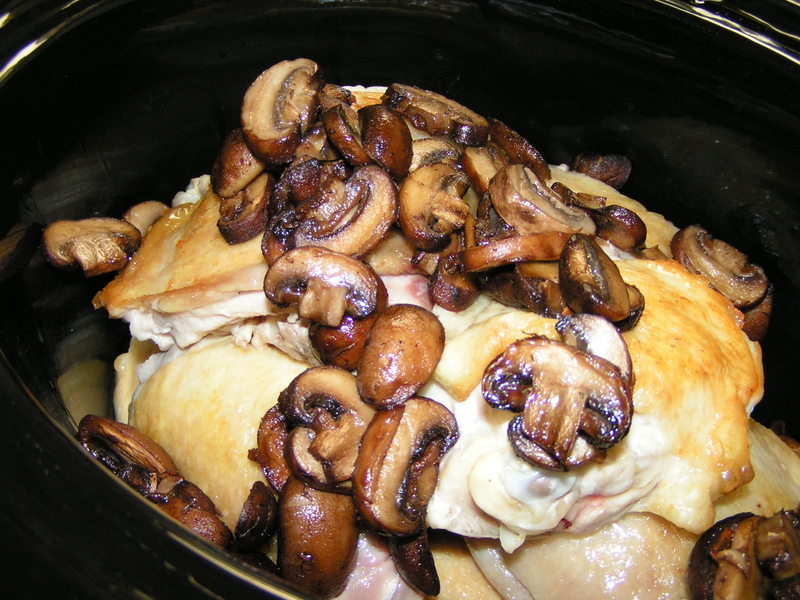 Do you add the soup mix and wine to the crockpot, or the sauteed mushrooms? Made it, and Hubby liked it, but thinks it needs rosemary…maybe some balsamic vinegar. 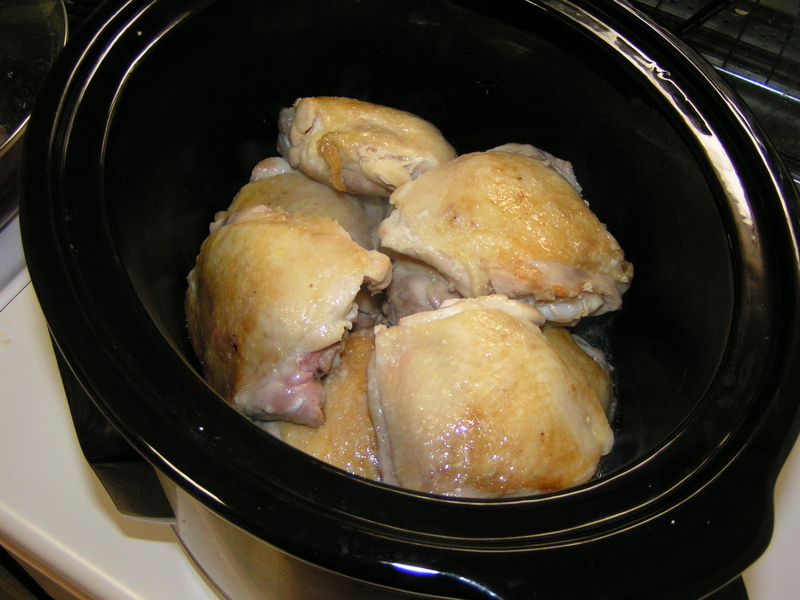 I put it in the bottom of the crockpot before I added the chickens. Would you believe the boys complained that I wasn’t careful enough deboning it. Like they can’t do that themselves…I just snagged the big ones to be completely honest!